As you probably know, I've never really discussed a modern television show on here with the exception of Mad Men; however, I'd like to break tradition to spread some love for my new favorite reality show American Pickers, which airs on The History Channel. If hearing the phrase "reality show" makes you want to run away screaming, let me make my case that anyone with an interest in vintage items or pop culture, especially from the 20th century, could benefit from watching this show. After seeing a few full episodes online, I've learned what "trench art" is, how much a Beatles "butcher cover" in perfect condition is worth, and about the different types of surfboards that were made during the 60s. The show follows two guys, Mike Wolfe and Frank Fritz, as they travel the U.S. in their van looking for anyone with a sizable and potentially valuable collection of vintage items that they can "pick" through to resell for a profit. Mike and Frank get their leads from Danielle, their assistant/accountant back at their store/warehouse they call Antique Archeology. Many of the people who own these treasure stashes are true American characters--farmers, bikers, mountain men, and former hippies as well as serious collectors. Some might also call them pack rats or hoarders, but the stuff they've amassed is usually awe-inspiring (well, except for maybe the old dude who was keeping GARBAGE along with junk in a scary, dark attic that Mike and Frank compared to the house from The Blair Witch Project.) Some of the items that the guys have picked and purchased include antique motorcycles, neon car dealership signage, rare toys, a gasoline pump, vintage NASCAR auto parts, and a 1939 Ford "Woody" Wagon. Oh, to be in Danielle's spot...sans Frank. The show is not without its criticisms; there's rumors online speculating that one or both dudes may be gay (I won't repeat the nasty play on words of the show's title) and many viewers consider them to be crooks who are ripping innocent people off. While the show often shows the guys scheming behind the scenes for good price haggling, as Mike put it in one of the episodes (I'm quoting verbatim), "we like to make sure items go to their rightful place." They've donated picked pieces to museums on occasion and they are, after all, self-employed and trying to make a living. Anyways, I think I've made my point. I am addicted to American Pickers. You can visit the show's site to get the schedule, watch clips and full episodes and learn more. 'Dems good picking over there. Are you a fan or a foe of this show? I only just saw this show about 3 weeks ago at my mother-in-laws. I was SO glad to get home and find it on Netflix instant. My wife calls this and Pawn Stars and another restoration show (I think they were all running for about 3 or 4 hours straight) "Antiques Roadshow on Steroids." I still haven't seen too many, but I really like it. My dad is an antique dealer, so I am very familiar with that culture. Retro Hound - that's a good nickname for these genre of shows. I'm not much of a fan of Antiques Roadshow because they seem to focus on the same types of items like artwork, 19th century furniture, etc. I like that most of the collectors on American Pickers are fans of 20th century items. This is one of my hubby's favorite shows, too....he loves seeing what kind of stuff these guys find...and of course, the history of some of these artifacts is explained on almost every show. 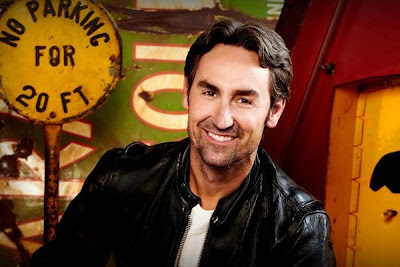 Doug - the only reason I found out about it myself is because Mike Wolfe came up as a recommendation for me to follow on Twitter, because of the vintage slant. I was like, "who is this good looking guy who goes by the profile name American Picker?" and I was hooked. There's been a few episodes where the guys give more money sometimes for cheaper items if they think the price quoted was too low...and I agree that most stuff would just keep sitting there and not see the light of day had they never shown up. Marlene - yep, you never know what they're going to dig up or what people collect. It's pretty amazing. Good show; collecting is obviously often a labor of love or with deep emotional attachment - I have found that not everyone can truly empathize and only think of the money and/or the untidiness. I am one to not care for their methods or type-a impatience and persistence, though admittedly they would not be able to make a living or show with simple serendipity. Myself, I love (my small, selected) stuff, and I would rather bury it, give it away to the grandkids or neighbor who show an interest, than sell it to a stranger. Another thought; having a true "junkyard" is simply the greatest adult, technical, playground; like having an old library of books to read, you seldom need for shallow entertainment. There is always something interesting to Make/do/build/curate/repair. Another reason not to sell it piecewise. Stay-at-home-dad - it's great that you have people you can pass your collectables to, and sometimes the owners on the show have special items that they refuse to sell. I've seen practically every episode of American Pickers and loved every one. As a collector myself I identify with the passion exhibited by Mike and Frank for the items they pick, treating them as pieces of history instead of junk. I do not believe the prices they pay are too low when you consider that they don't keep the items but resell them to others who will in turn resell them to the public such as antique dealers. This show is great. It reminds me of my lifestyle right after college when I could not actually get hired for a "real job" through much of the 1990's and had to live off instincts and flea markets...I still have those same instincts and use them to build my own mega-collection of not-from-now treasure. And you can always learn something great from this show. It is also "mainstreaming" retro to the mundanes and normals of the world who do not know the joy of such things. Pam - Okay, now I definitely am going to have to check this show out. I'm getting so bored with some of the shows that I've been watching and even gave up on a few of them. This does look like an interesting one. Your new crush reminds me a little of an English actor that my aunt and I think is cute, Nathaniel Parker from Inspector Lynley. My dad is a big Antiques Roadshow fan. I have seen that 5 or 6 times. I agree - not as fascinating as seeing 20th century stuff. I don't understand folks' problem with the show. How is what the guys do any different than Goodwill making a profit from donated goods? From a curbside trash picker selling stuff at the flea market or online swap page? Heck, I just converted a trash-picked elliptical trainer into a small MIG welder via online swap notice board and I couldn't be prouder! The guy who bought the elliptical was just as happy as the guy who sold me the welder, and it kept stuff out of the landfill! The pickers pay what the owner is willing to take. They aren't jumping fences and stealing stuff outta barns or taking advantage of little old people with Alzheimer! They are making an honest living in a straightforward manner. The people who sell them stuff see the camera crew, so it isn't like they don't have an idea what's going on. stonemaven, I agree...the other thing that people need to realize is that quite often the items are in such poor condition from being stored or buried in dirt for a half-century that they're simply not worth the full price had they been in perfect condition. If an Airstream trailer from 1947 is rusted and moldy and needs windows then no, the owners shouldn't expect to get $25,000 or whatever the value would be of a perfectly restored trailer. And in many cases if it hadn't been for Mike and Frank taking an item off someone's hands, it would continue to rot and rust in the ground after they passed away. Many people on the show often say, "I wish they had bought more stuff from me!"